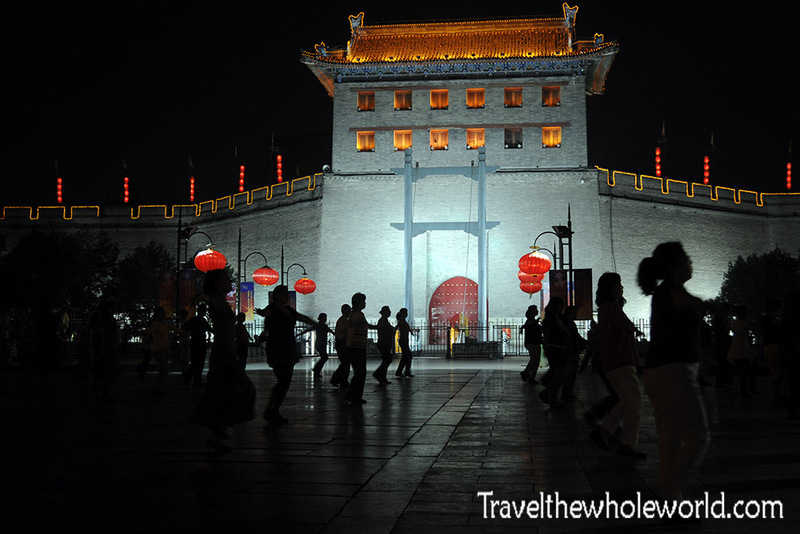 Although I had a brief stop in Beijing, Xi’an was the first place I really began to explore in China. Xi’an was once one of China’s four ancient capitals, with some of the best history in the country. 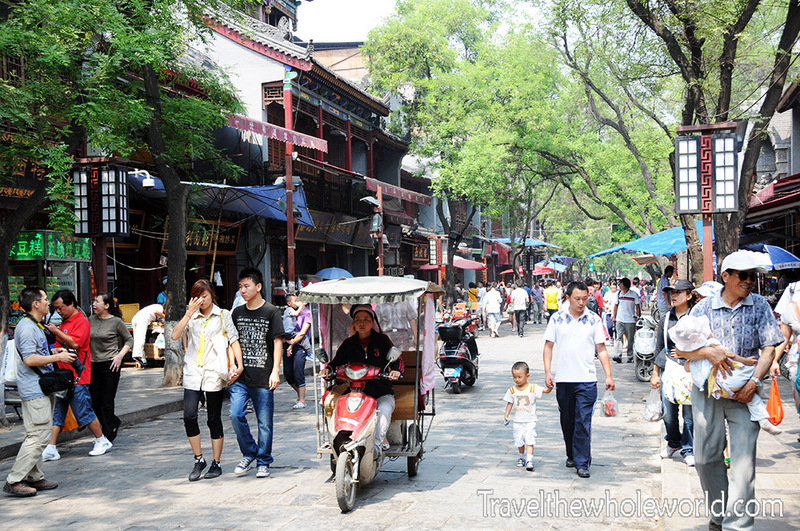 Despite its age, Xi’an only has a population close to one million, and is still considered small by Chinese standards. 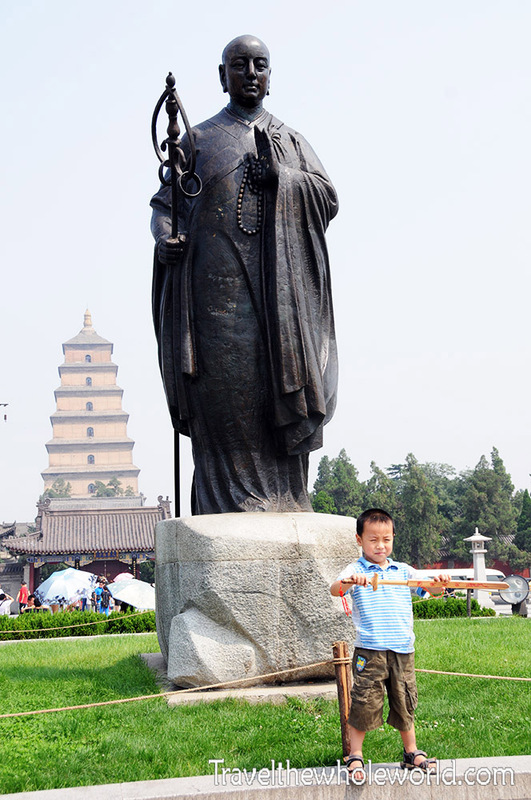 My first photo shows a young Chinese kid proudly posing in front of a statue and the Big Wild Goose Pagoda. The Big Wild Goose Pagoda was built in the 7th century, and is being guarded by a statue of the famous Chinese monk Xuanzang in the foreground. 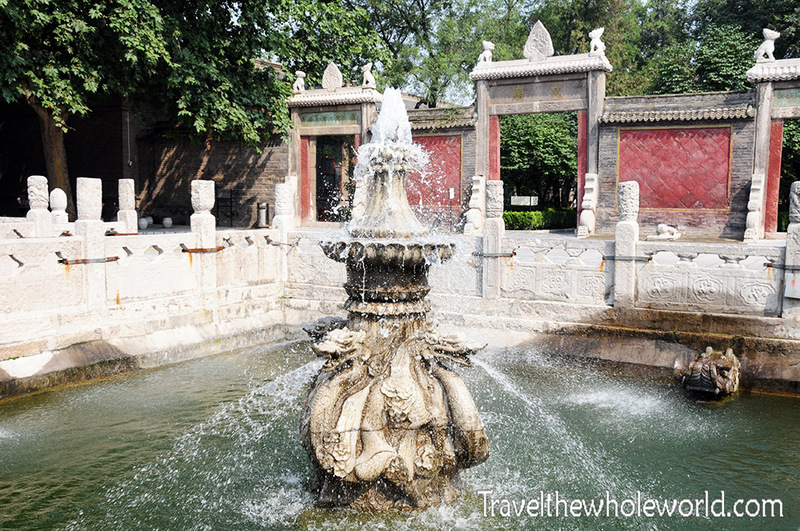 I began exploring Xi’an right in the city center. 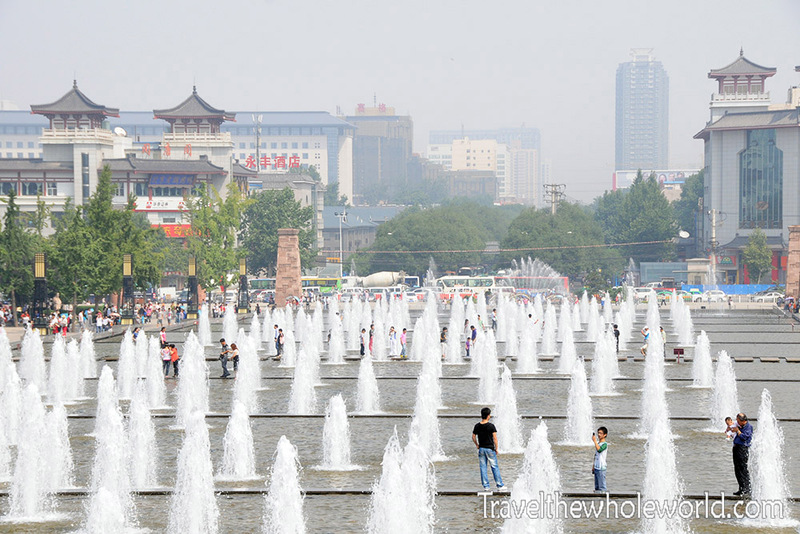 Directly in front of the Wild Goose Pagoda is a large area lined with small fountains. Each side of the fountains had several Chinese and even a few foreign restaurants. 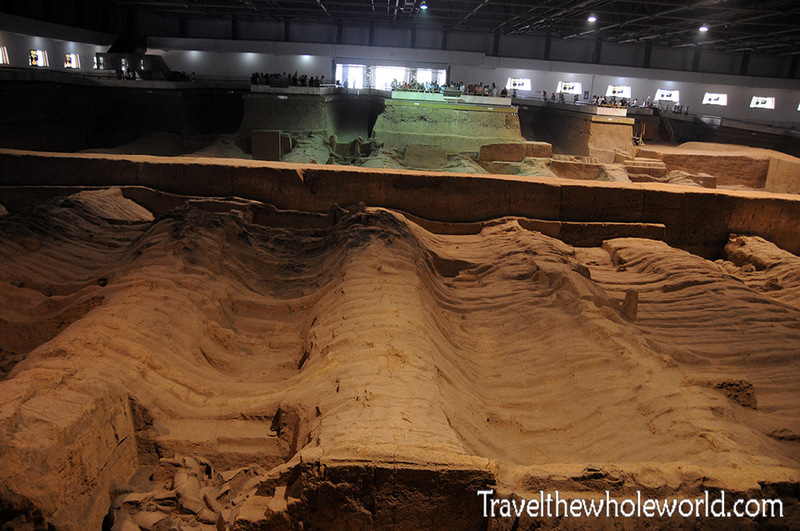 Like most nations, even the ancient city of Xi’an is still subjected to western influence. 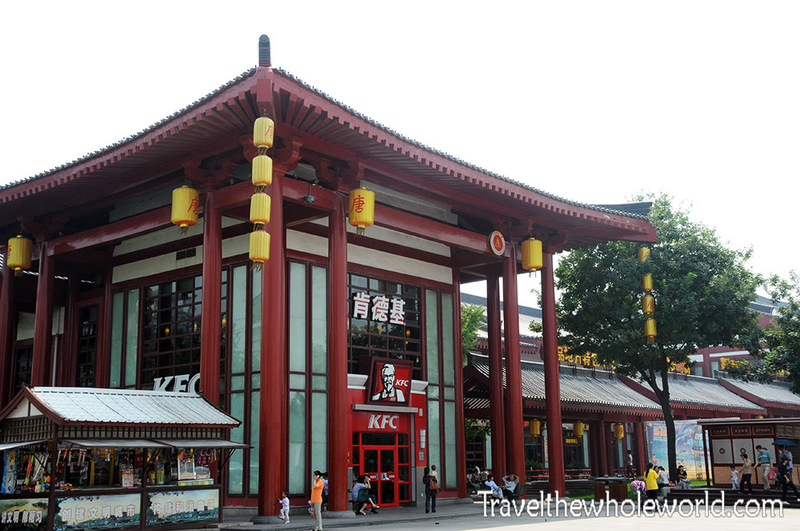 I was a bit surprised to find the KFC below in the heart of such a historic city! 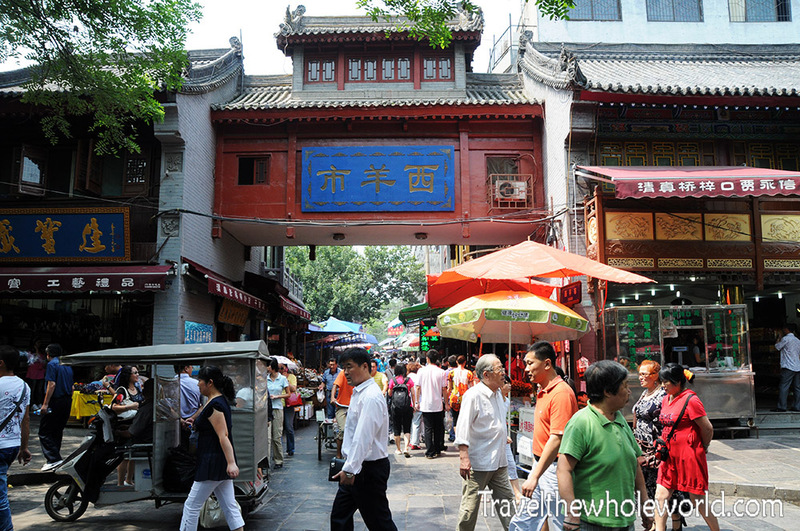 I was definitely naive to think that Xi’an would be nothing but old traditional shops. Elsewhere in the city, you’ll find things that are up to par with Japan or western Europe. 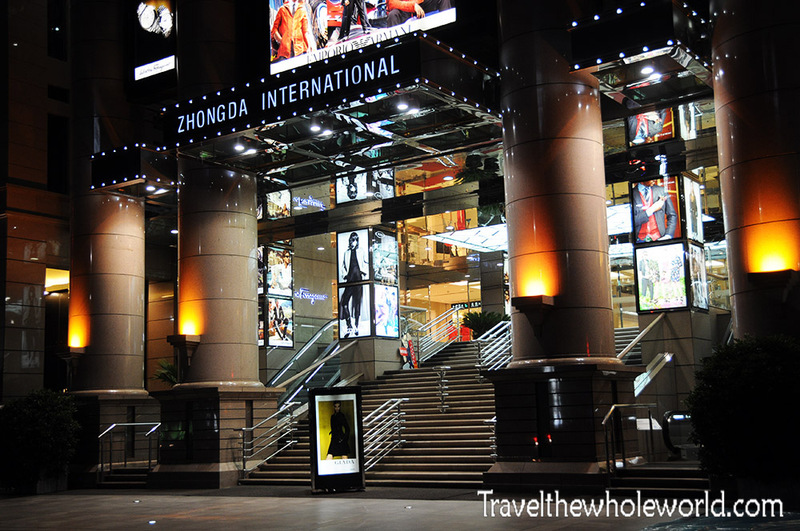 Xi’an has plenty of modern stores and malls. I passed by this mall and was told by a local that it was the nicest Xi’an has to offer. 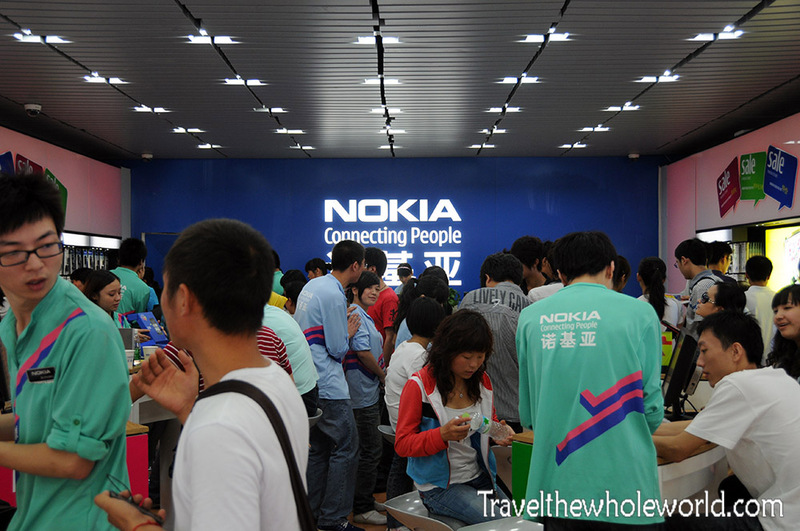 Below shows a busy Nokia store that was mostly packed with young people. While exploring the city on foot, I came across these girls who were advertising beer outside of a popular restaurant. Maybe I should have gone in, but I generally try to avoid having a drink while I’m traveling by myself! Once I started to properly explore Xi’an, I was immediately taken back by the architecture, history, and the great people here. I attempted to do my usual random exploration in the city. I tried to enter this part of the town in this photograph above, but was politely turned back by a guard. I never found out what its purpose was, but must have been some government facility. I always prefer walking, but taxis and other public transportation is extremely cheap here. I should have tried to rent a bike. 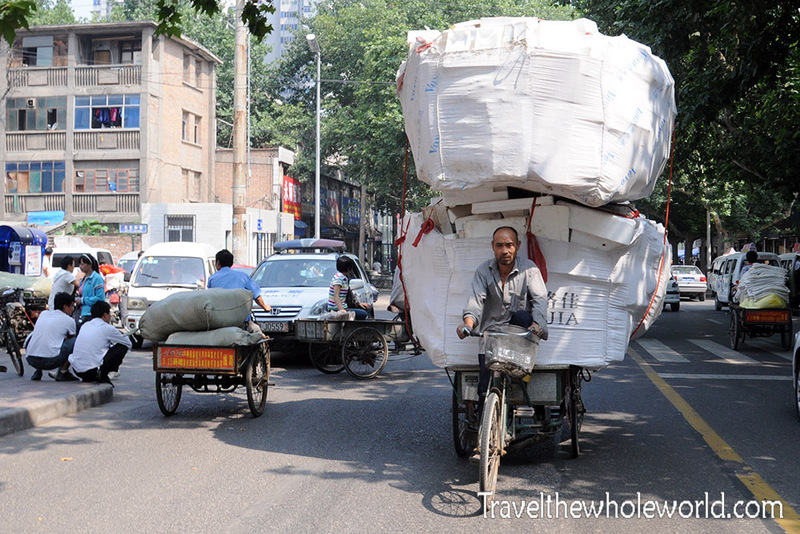 This guy must have a world record for carrying a load on a bike. Most places where you’ll need to communicate you’ll find people who speak English like in the airport, hotels, and business districts. Otherwise all the taxi drivers and random people I encountered didn’t seem to understand a single word. Likewise, I can’t say my Chinese at the time was any better than their English! When I first got to Xi’an I mistakenly thought I was smart enough to walk to my hostel on my own. After getting lost on the way I finally found a girl who spoke English and was able to ask for directions. She actually walked with me for 20 minutes through the city to get me where I needed to go then continued on her way! This experience along with a few other good people I met made me feel that Xi’an is one of the most friendly cities I’ve traveled to. 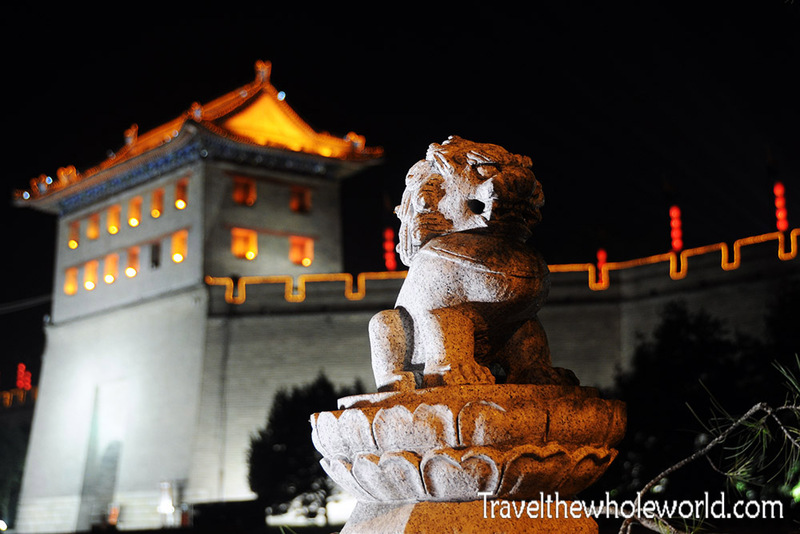 While Xi’an has a number of interesting places, one of the most famous are the city’s enormous stone walls. These are actually considered to be the largest city walls on earth! The first walls began construction over 2,000 years ago, and like most historic palaces and fortifications, it was expanded over time. Currently the walls total just under 10 miles in length with the base of the walls nearly 60 feet wide in some areas. 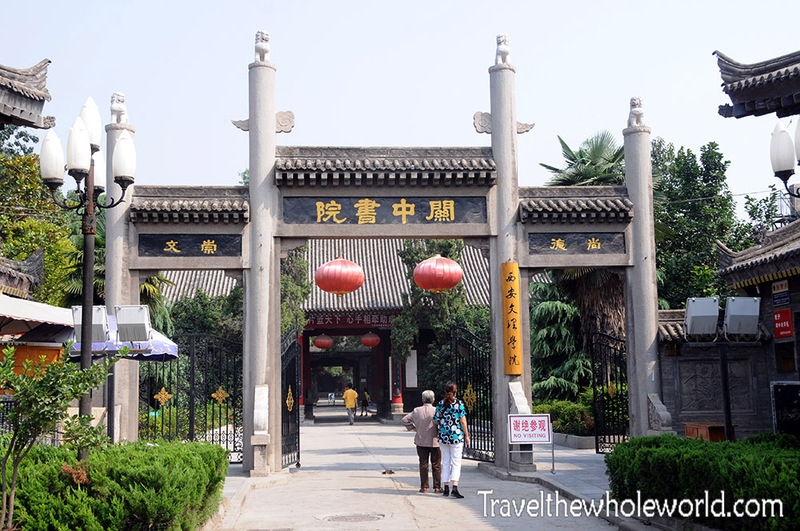 There are several different gates for both people and cars to enter the inner city of Xi’an. Both photos above and below are from the south gate. The first photo shows a statue of a dragon near the entrance while the other captures people some kind of ceremonial dance. 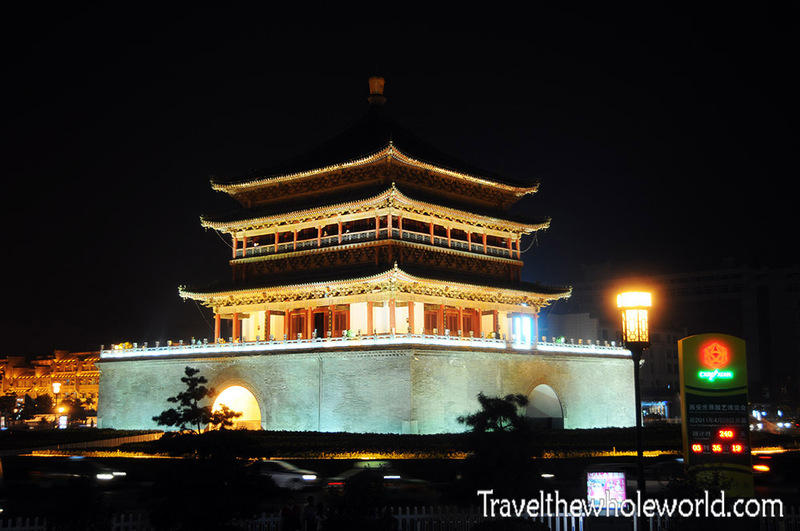 In the heart of the city is Xi’an’s bell tower which was built in 1384. The only way to enter the Bell Tower in modern times is to go through one of the underground walkways that are used to cross the busy streets. 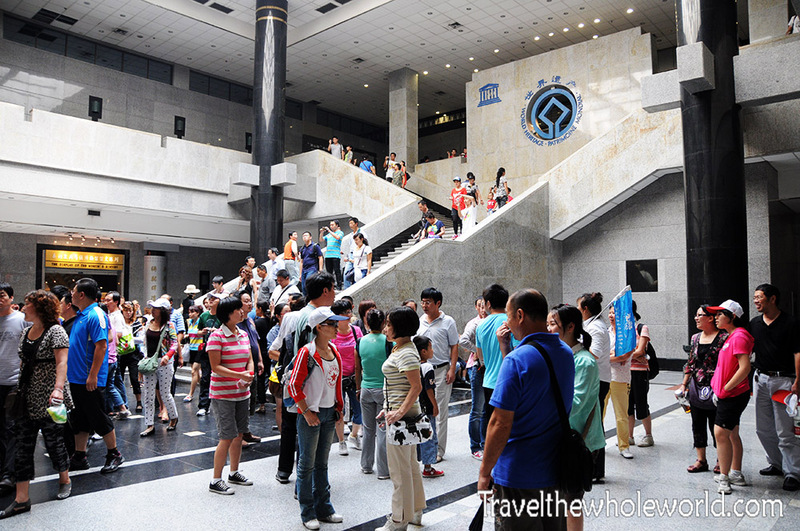 When I arrived to Xi’an, I had lost my hotel address and had no way to find out where it was. The only thing I knew was the name and that it was close to the bell tower. The taxi driver didn’t anything I was trying to say, so my solution ended up drawing the bell tower on a piece of paper. It actually worked, the taxi driver took me to the tower and from there I was able to find my room. 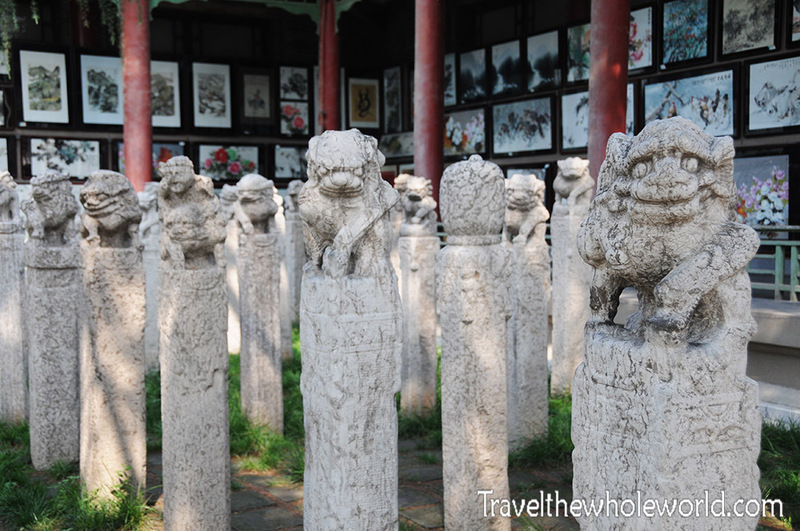 A unique museum to visit in Xi’an is the Stele Forest. 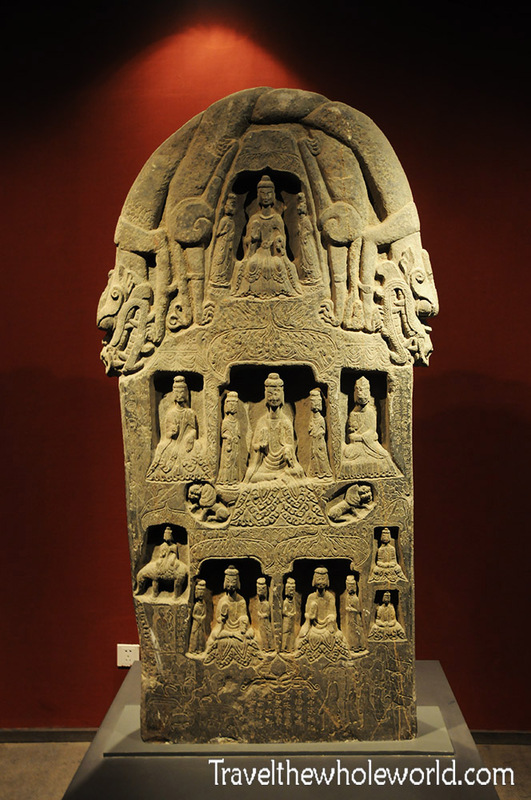 Chinese steles are typically small rectangular stone pillars that are used to inscribe poems, stories, maps and information about a range of topics. There are some 3,000 steles in this museum making it the largest collection in the country, if not the world. These two photos are from the museum’s outside areas, where they’ve lined up dozens of steles next to gardens and fountains. The inside of the museum has the most important steles. This one here was my favorite due to its size and detail. I had always thought the steles were slender stones like the ones I had seen outside. This one proved me wrong. I was surprised to find out that Xi’an actually has a Muslim quarter. Somewhere here in these crowded streets is China’s first mosque. I made several serious attempts to find the mosque, but somehow it eluded me. I suppose that’s what I get for leaving my map in my room! I don’t think it’s really difficult to find, I probably just had bad luck. Later on any other tourist I met who had visited Xi’an all told me they made it to the mosque without issues. As you can see though, the Muslim quarters doesn’t look very different from the rest of Xi’an at first glance. If you spend some time walking around you’ll see several Chinese wearing traditional Islamic head scarfs, but not the full burqa. Before I came to China I was in some need of shopping but I figured what better place to do it than the source! 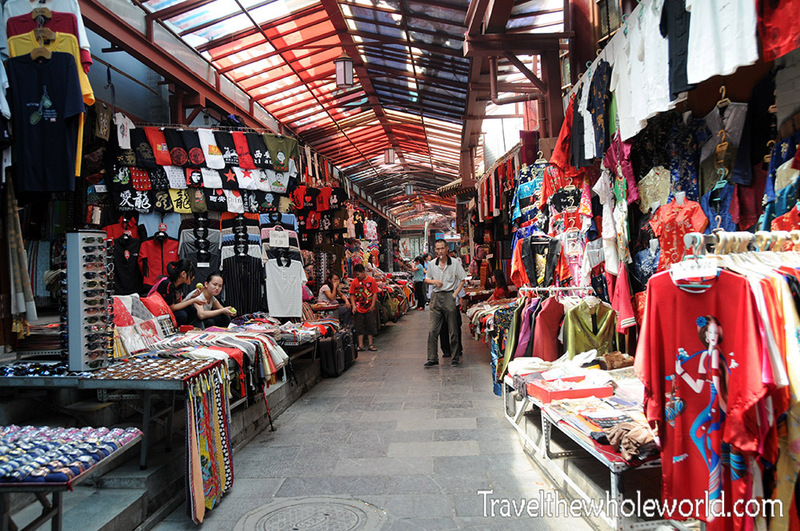 Above is one of many clothing markets in Xi’an. I actually did buy some clothes as well as replaced my day pack and my main traveling pack for a pretty reasonable price. I had done this before in Malaysia but after this trip promised myself this would be the last time. All packs that I’ve purchased overseas may be low in price but are also low in quality. 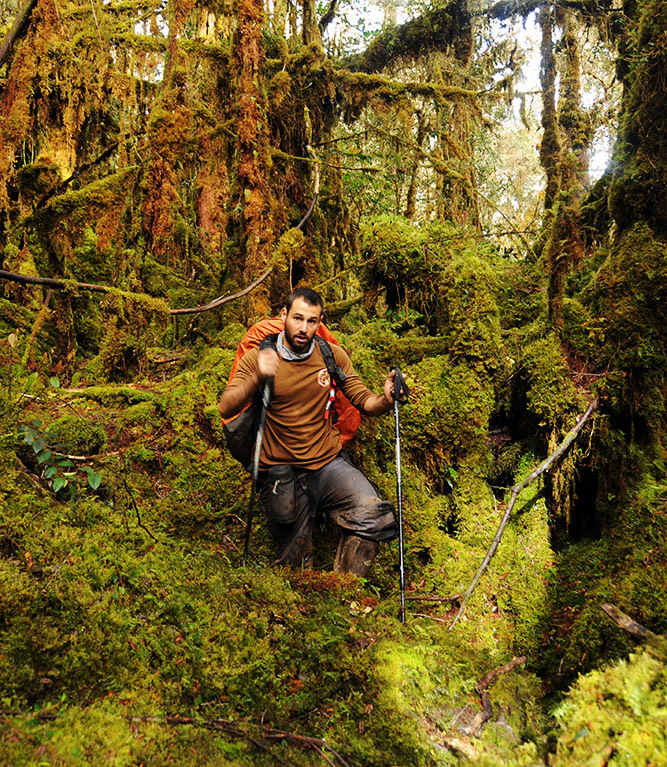 Within a trip or two I had straps breaking off my pack and tears in the fabric. I found this shirt in the market pretty interesting. 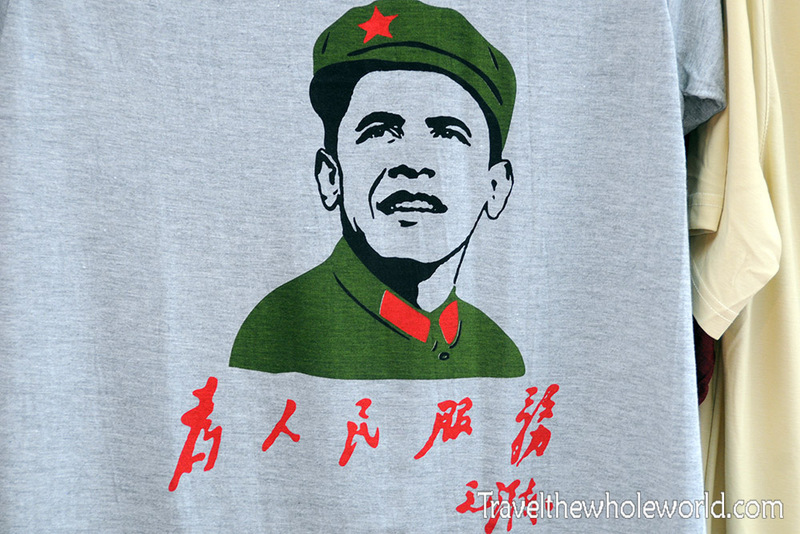 A famous drawing of Che Guevara had been replaced with President Obama. I asked a local what the Chinese writing meant and was told it stays for, “For the comfort of the people”. Also nearby the clothing area is a large meat market I stumbled across. 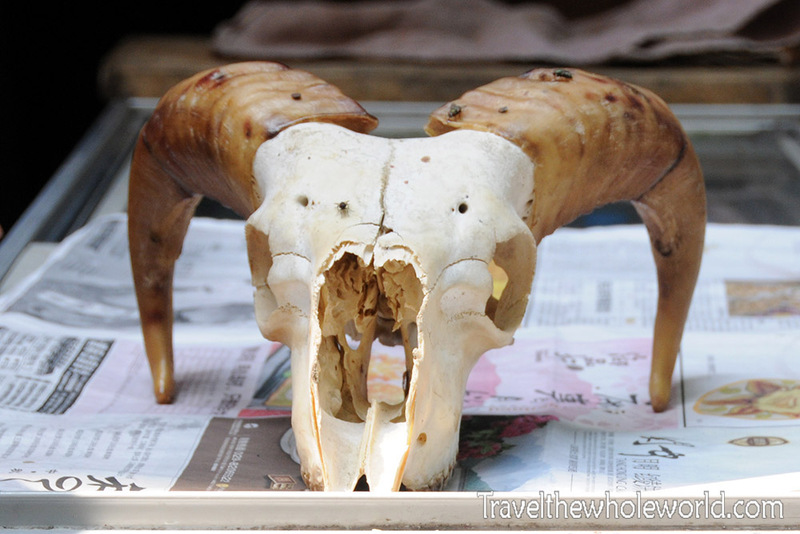 I’ve been through plenty of meat markets in other countries, but this one was a bit different. I gotta say by the time I passed through the gauntlet of skulls, bones, slabs of fly covered meat and other grotesque scenes I nearly became a vegetarian. 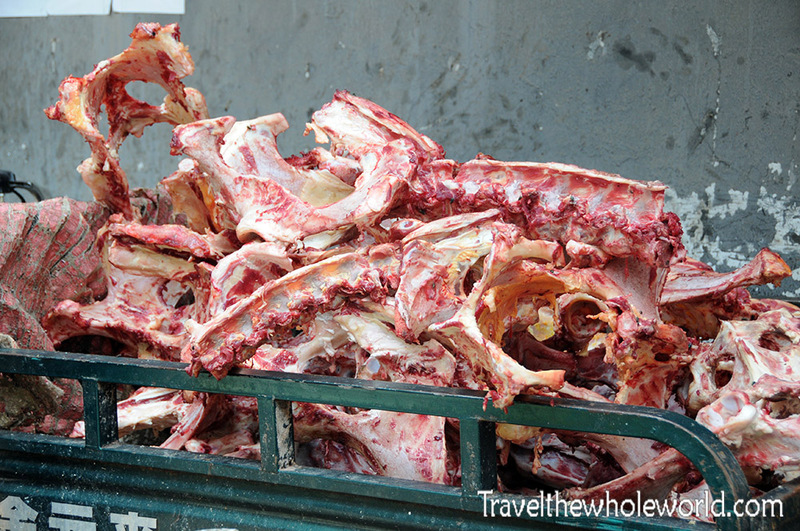 I suppose if the meat had been cooked it wouldn’t have been so bad, but the different smells of various types of raw flesh and scenes like the cart of spinal cords below didn’t appeal to me. Needless to say, I didn’t have dinner here. 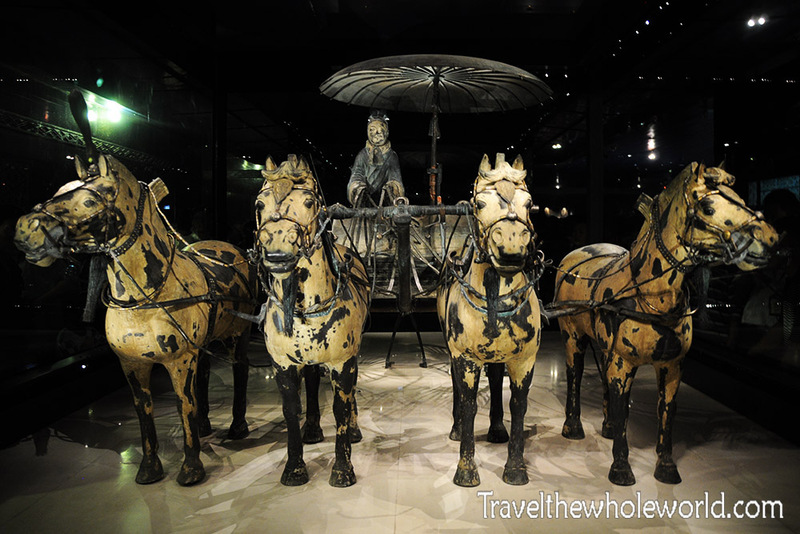 My main reason for coming to Xian was to see the terracotta warriors. 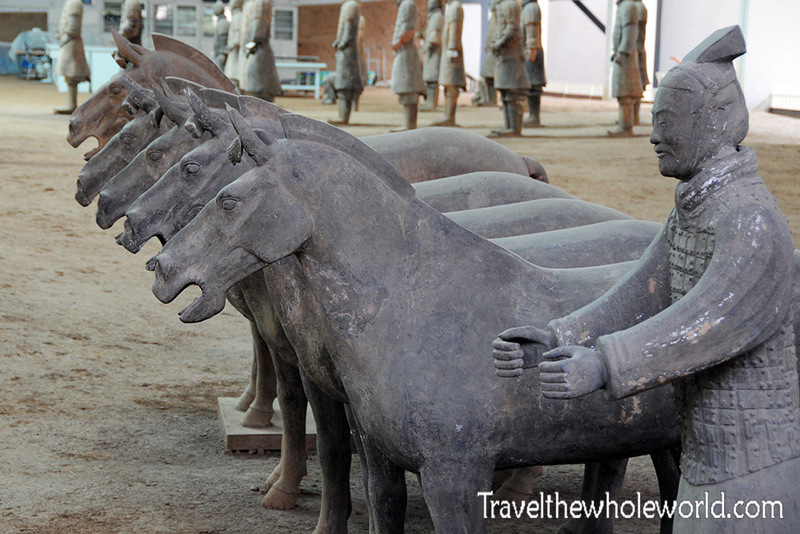 About 40 kilometers outside of Xian is the Terracotta museum. Getting here I had a mini adventure trying to figure out how to find the right bus from the city. 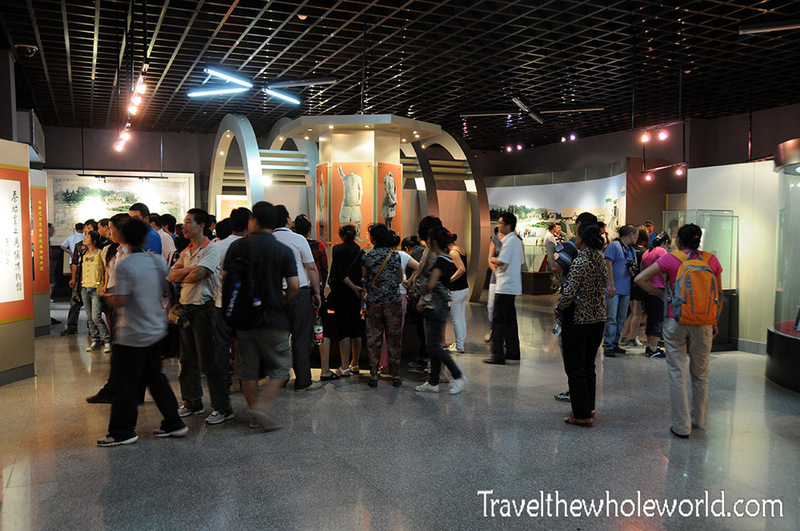 Fortunately for people like me, they created a tourist friendly system and it was easy to get to one of China’s biggest attractions. After I arrived to the museum and saw the thousands of people here and all the effort that was put into this place, I felt like I was in an amusement park. 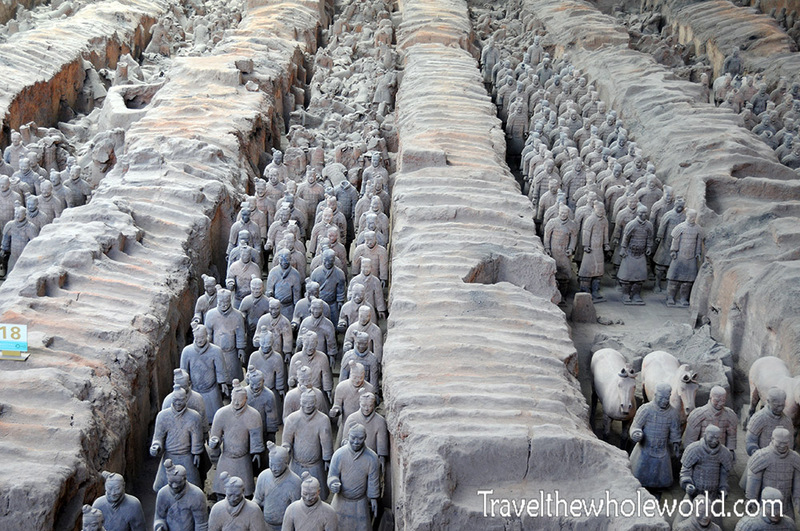 The Terracotta army was discovered not so long ago in 1974 by local farmers. The large pits you see on the left were actually covering thousands of life size stone soldiers. The long phalanx of warriors you see on the right are just some that have been uncovered so far. It’s estimated that there are about 8,000 more soldiers, not to mention stone chariots and horses, most which still remain buried. 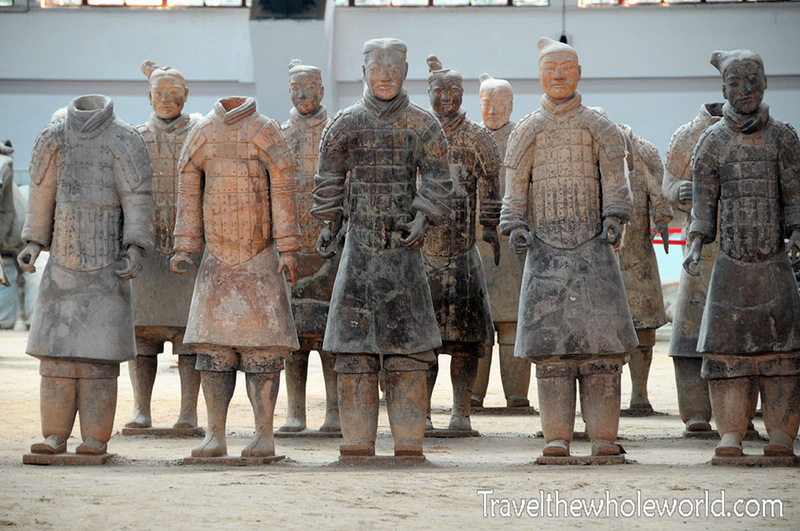 These warriors are estimated to be around 2,000 years old and were created for the first Emperor of the Qin Dynasty. The motives of creating an entire stone army were similar to the beliefs of ancient Egyptians. They believed their emperor would later need these soldiers and command them in his afterlife. 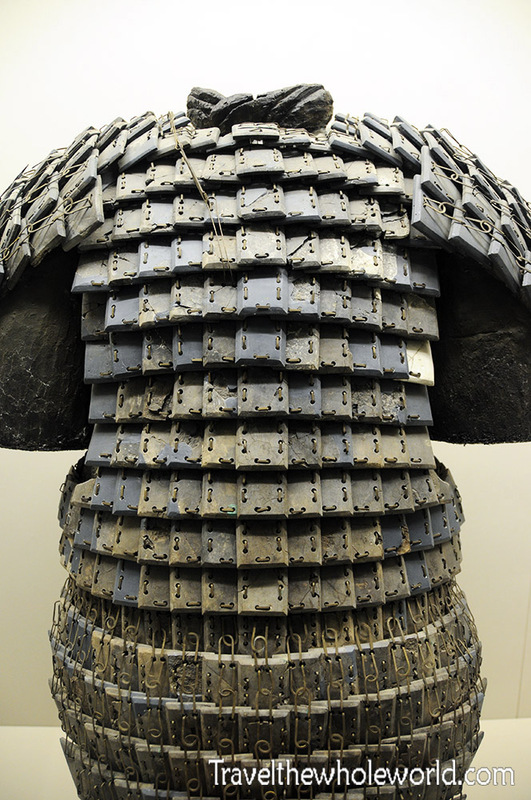 Emperor Qin is one of China’s most important historic leaders. He brutally united his empire through wars, torture, and intimidation around 220BCE. Although he did many terrible things such as torturing and killing anyone who opposed him, he is largely credited with unifying China for the first time in its history. His name is spelled Qin, but is pronounced more like chin, and this is where the English word for China comes from. These last two photos show some stone armor photographed above, and a full chariot along with a driver and four horses below.